Sleaford Town paid the price for missed chances as they opened their United Counties League campaign with a narrow home defeat on Saturday evening. Lady luck was definitely not on Town’s side as they saw two efforts cleared off the line and another disallowed as Deeping Rangers left Eslaforde Park with a 1-0 win. 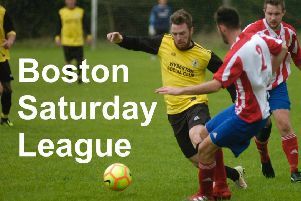 Jamie Shaw’s side started their Premier Division season a week early to be part of the Groundhop Weekend with few friendlies under their belt after postponements. But their new-look squad did not look under-cooked as they created several openings against perennially strong opponents in front of a bumper crowd of 285. Rangers went ahead after 17 minutes with a move of quality which sliced open Town’s defence for Michael Simpson to finish. But Luke Hollingworth’s volley looked to have levelled the scores until Luke Hunnings cleared off the line with his head. Nathan Rivett also thought he had claimed a debut goal for Sleaford, only for his header to be chalked off for offside. “There were lots of positives to take from the match although there was a huge sense of frustration that we had come away empty-handed,” Shaw said. “I thought that we more than matched Deeping who are always a strong side. “We also felt that we got the wrong side of a decision not to send off their centre-half in the third minute for denying an obvious goalscoring opportunity. Town face another stern test of their credentials on Saturday when they travel to Newport Pagnell Town, another side to finish in last season’s top five. But the last encounter between the sides gave Town their best result of last season when they stunned the title challengers 4-1. And Shaw saw enough in Saturday’s display to take confidence into the outing (ko 3pm). “We’ll take the positives into training this week and look to continue in the same positive vein,” he added. Town: R. Start, L. Hargrave, J. Pemberton, D. Worthington, L. Hollingworth, S. Bolland, L. Harper, C. Newman, J. Smith, G. Couzens, N. Rivett.